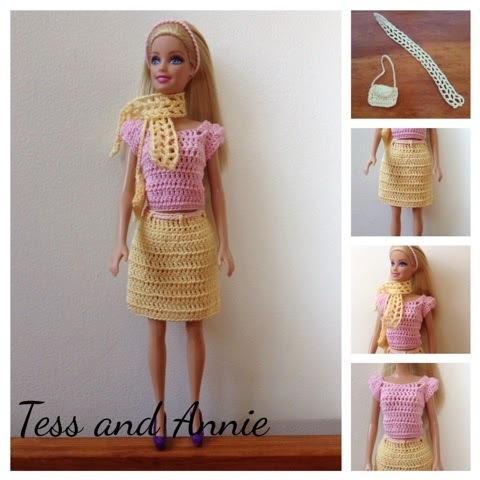 It has been a while since I have posted a Barbie outfit, so I decided to post a spring outfit for Barbie today. This outfit is very simple and easy to make. It shouldn't take more than two days to complete. It can also be used as an Easter outfit. Row 1: Ch 44, tr in 5th ch from hook, 1 tr in each ch across, turn. Row 3: Ch 1, (1 sc in each of the next 2 sts, 2 sc in next st) across, turn. Row 4-5: Repeat row 2. Rnd 6: Repeat row 3, join to 1st st.
Rnds 7-16: Ch 3, 1 dc in each st around, join. Rnd 17: Ch 1, 1 sc in each st around, join. Fasten off. Ch 40. Fasten off, leaving tail ends. Sew one end to end of row 1 (tr row). Weave through tr's. Use other tail end to fasten the ch to end of row. Weave in all ends. Sew one snap to opening in back. Row 1: Ch 41, sc in 2nd ch from hook, 1 sc in each ch across, turn. Rows 2-10: Ch 3, 1 dc in each st across, turn. Row 11: Ch 1, 1 sc in each of the next 12 sts, 1 hdc in next st, 1 dc in next st, 1 tr in next st, ch 10, going backwards across row, skip 9 sts and sl st in next st, turn, ch 3, 1 dc in each ch across, (back to normal row now) 1 tr in each of the next 2 sts, 1 dc in next st, 1 hdc in next st, 1 sc in each of next 2 sts. Fasten off and repeat starting at opposite end. Join onto bottom of each armhole with pink. Rnd 1: Ch 1, 1 sc in each of next 4 sts, 1 hdc in each of the next 2 sts, 2 dc in next st, (2 tr in next st) 4 times, 2 dc in next st, 1 hdc in each of next 2 sts, sc in last st, join. Rnd 2: Ch 1, 1 sc in each of next 4 sts, 1 hdc in each of the next 2 sts, 1 dc in each of next 2 sts, 1 tr in each of the next 8 sts, 1 dc in each of the next 2 sts, 1 hdc in next st, 1 sc in each st to end, join. Rnd 3: Ch 1, 1 sc in each of the next 6 sts, (sc dec) 6 times, sc to end, join. Fasten off. Ch 40, sl st in 1st ch. Fasten off. Weave in ends. Row 1: Ch 13, dc in 4th ch from hook, 1 dc in each ch, across, turn. Rows 2-8: Ch 3, 1 dc in each st across, turn. Row 9: 1 sl st in each of the 1st 3 sts, ch 1, 1 sc in each of the next 5 sts, leave remaining sts unworked, turn. Rows 10-13: Ch 1, 1 sc in each st across, turn. Fasten off. Fold wider part in half, with the narrow part at the top (you will use that part for the flap). Sc one side together, sc across bottom of purse, sc together other side. Sc up one side of the flap, sc across flap top, sc down other side of flap. Join thread onto the top end of purse. Ch 40, join onto other top end of purse. Fasten off. Weave in all ends. Sew a buttonhole on the middle of flap. Sew the 3mm bead underneath buttonhole. Question on the shirt, row 11, after 1 dc in each ch across(back to normal row) then you say 1 tr in each of the next st. ? how many, or is that turning again and tr. in each of the 10 dc. In row 11, you don't turn, but you keep going in the direction you started in and you crochet 2 triple crochets. I hope that helps!